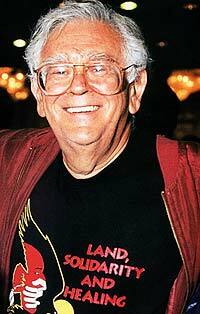 Joe Slovo was born in Lithuania in 1926 and moved to South Africa with his parents at the age of nine. His father was a van driver in Johannesburg, and Slovo worked as a dispatch clerk for a chemist while studying law at the University of the Witwatersrand, where he graduated with a Bachelor of Arts degree and Bachelor of Laws degree. He volunteered for the South African forces during World War II and was subsequently active in the Springbok Legion, a radical ex-servicemen's league. Slovo was an active member of the South Africa Communist Party (SACP) from the 1940s and, after becoming an advocate at the Johannesburg Bar, became well known for his work as a defence lawyer in political trials. He married Ruth First, daughter of SACP treasurer Julius First, in 1949. The following year the couple was among the first 600 people 'named' in terms of the Suppression of Communism Act, and thereby subjected to various restrictions. Slovo was a founding member of the Congress of Democrats in 1953 and represented the organisation on the national consultative committee of the Congress Alliance created at the time of the call for a Congress of the People. In 1954, he was banned from attending all gatherings under the Suppression of Communism Act, but continued his political activities covertly. Slovo contributed to the drafting of the Freedom Charter, but was unable to attend the Congress of the People in Kliptown because of his restriction order. He watched the proceedings through binoculars from a nearby rooftop. In December 1956 Slovo, together with other Congress activists, was charged with treason. He acted as a member of the defence team as well as being an accused. During the preparatory examination of the Treason Trial, as it came to be known, he was charged for contempt of court when objecting to the magistrate's handling of the examination, but was acquitted on appeal. Treason charges against him were dropped in late 1958. During the state of emergency in 1960, following the Sharpeville massacre, Slovo was detained for a four-month period. Slovo was one of the earliest members of the military wing of the African National Congress (ANC) Umkhonto we Sizwe, and regularly attended meetings of its high command at Lilliesleaf Farm, Rivonia. He left the country in June 1963 on an 'external mission' and a month later police captured the remaining key figures on the high command, including Walter Sisulu and Govan Mbeki. A month after the arrest, Slovo's wife - Ruth First - was detained for almost four months. On her release she left the country, together with their three daughters. Slovo continued to work for the ANC and the SACP abroad and in 1977 moved to Maputo, Mozambique, where he established an operational centre for the ANC. In 1982, Ruth First was killed in a parcel bomb explosion in Maputo. Two years later, Slovo was forced to leave Mozambique following the signing of the Nkomati Accord between that country and South Africa. In January 1986, a British court awarded Slovo substantial damages against a South African newspaper group over a report in The Star newspaper that he had orchestrated the murder of his wife. Slovo was chief of staff of Umkhonto we Sizwe until April 1987, a member of the central committee of the SACP, and served on the revolutionary council of the ANC from 1969 until its dissolution in 1983. At the ANC consultative conference held in Zambia in 1985, Slovo became the first white member of the ANC's national executive. Following the death of Moses Mabhida in 1986, Slovo was appointed general secretary of the SACP. Early in 1987, the SACP asked the ANC to relieve Slovo of his MK position as a result of the pressure of his duties as general secretary of the SACP. As a result he vacated the position of chief of staff of Umkhonto we Sizwe in April, but retained his position on the ANC National Executive Commitee and its political-military council. In June 1989, the SACP congress adopted a new programme of action to replace its 1962 guidelines. It is accepted that the strategies of armed struggled did not rule out the possibilities of negotiations and compromise. In January 1990, Slovo circulated a document entitled Has Socialism Failed?, indicating that the SACP would commit itself to a multi-party, post-apartheid democracy, freedom of organisation, speech, thought, press, movement, residence, conscience and religion; full trade union rights for all workers including the right to strike; and one-person, one-vote in free and democratic elections. The SACP and ANC were unbanned in February 1990, and Slovo was elected as the party's general secretary, but in 1991 he retired from this position largely because of ill health, he was subsequently elected party chairman at the SACP conference held in December 1991. At the ANC conference held in Durban in July 1991, Slovo was re-elected to its National Executive Committee. He also served on the ANC's national working committee. During 1991, Slovo served as an SACP representative on the National Peace Committee. In December, he was present at the Convention for a Democratic South Africa (CODESA) and served on its working group dealing with constitutional principles and a constitution-making body and process. After the 1994 elections Slovo was elected to cabinet where he served as Minister of Housing until his death on 6 January 1995.